Customers Ask Honest-1:Someone told me that a cabin air filter change is just what I need to help my constant sneezing in the car. Is that true? What IS a cabin air filter and what does it have to do with my allergies? As you drive, surrounding vehicles kick up all sorts of pollutants including road dust, soot, pollen, and other contaminants. Those pollutants, when left unfiltered, enter your car’s ventilation system, coming through the vents and into the car. 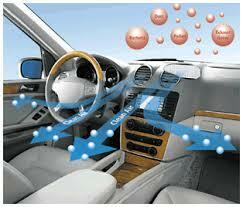 They can cause fine layers of dirt and dust on you, your car’s interior and circulate in the air you breathe. Yuck! So, how can you stop breathing in this dirt and debris? Think about the purpose of the air conditioning filter in your house. Its job is to filter the dust, dirt, pollen and allergens circulating in the air of your house so that you and your family can have fresh, breathable air. In your car, a cabin air filter does the same thing, but instead of cleaning the air in your house it cleans the air circulating inside your vehicle. A new cabin air filter can remove nearly 100 percent of the airborne particles entering your car, including microscopic particles like mold spores and allergens as well as larger dust particles. An old cabin air filter will not only allow those particles to come through, causing an increase in allergy symptoms, but also restrict air flow, making your air conditioning and heating system work harder. Over time this could cause the components of these systems to fail and costly repairs. So how do you know when your cabin air filter should be replaced? Recommendations vary by manufacturer and driving conditions. Most manufacturers suggest a cabin air filter change every 12,000-15,000 miles. HOWEVER…In Arizona, we drive into frequent dust storms and high wind conditions, making your cabin air filter dirtier sooner. In fact, your cabin air filter traps the contaminants for a while and then becomes clogged, requiring it to be changed more frequently than the above recommendation. 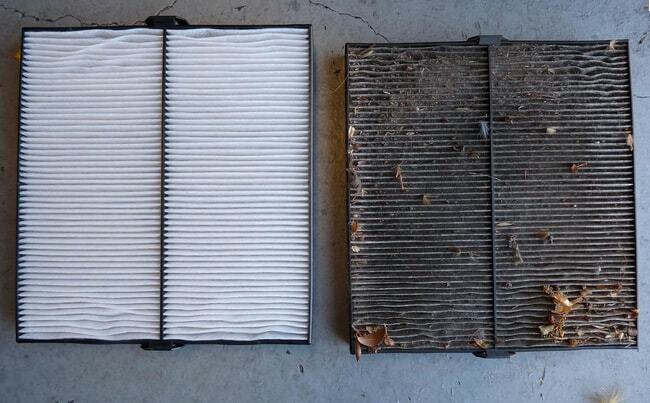 When is the last time you had your cabin air filter changed? At Honest-1, we do a visual inspection of your cabin air filter with each service ensuring that you are driving breathing easier with every trip! If we find that your cabin air filter needs a replacement, be sure to ask us to see the current one. You might be surprised to see soot, dirt, grime, and even leaves and twigs! 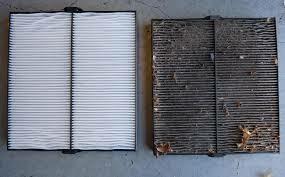 Come into Honest-1 today so we can check your cabin air filter. You could be breathing easier by tomorrow!